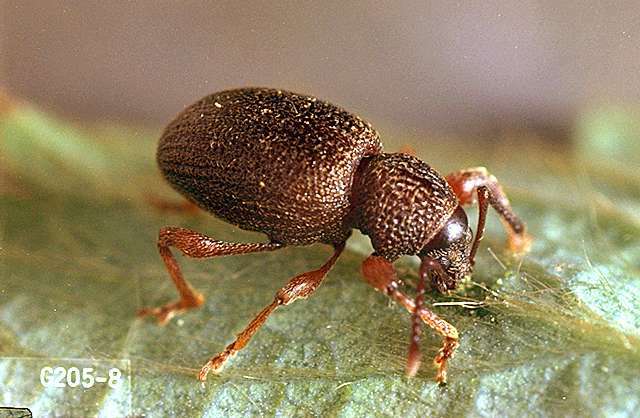 Pest description and crop damage Black vine weevil (BVW) is probably the most common weevil to infest strawberries, but the strawberry root weevil (SRW) and rough strawberry root weevil (RSRW) are also pests. 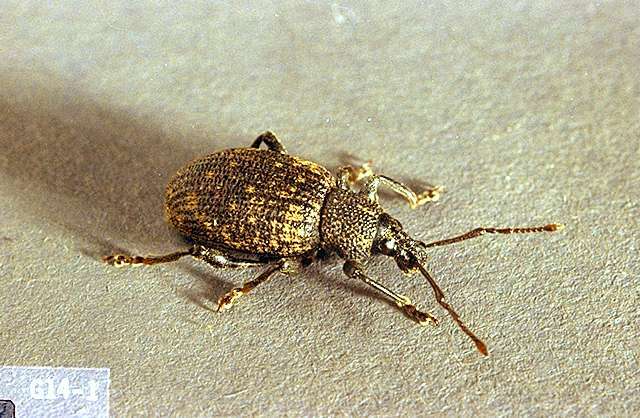 Adult weevils are 8-12 mm long, depending on the species. 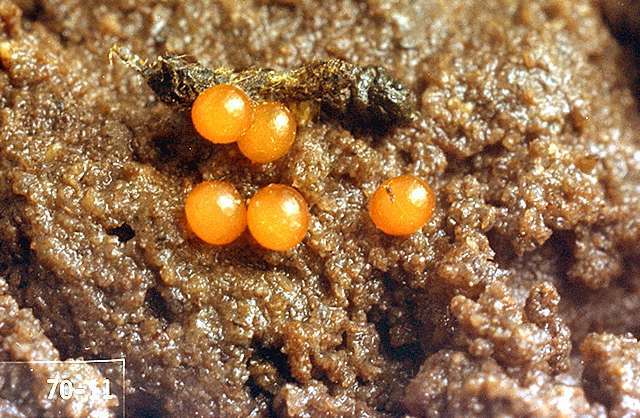 Adults are reddish brown to black; the BVW is larger and darker than the other species. Larvae of all species are quite similar in appearance and habits: they are C-shaped, legless, white with tan heads, and up to 12 mm long. Adult weevil feeding causes a characteristic notching in the leaves of strawberries and other host plants. This feeding damage is relatively minor and causes little damage to the plants. 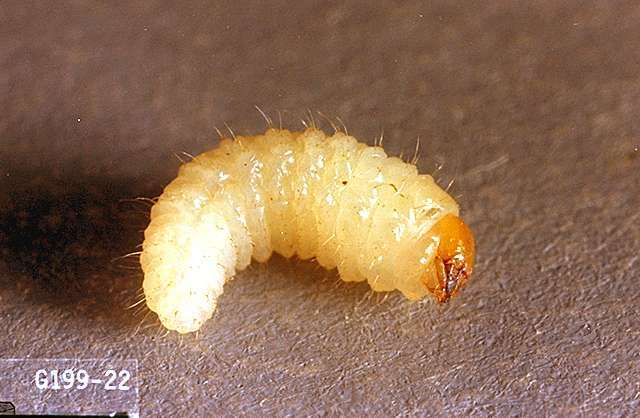 The real damage is done by the larvae, which feed through the winter and spring on the root systems of host plants. Larvae feeding on roots can cause stunting and poor yields. With severe infestations, plants may die. Biology and life history Weevils overwinter as larvae in the soil. Feeding may occur throughout mild winters. 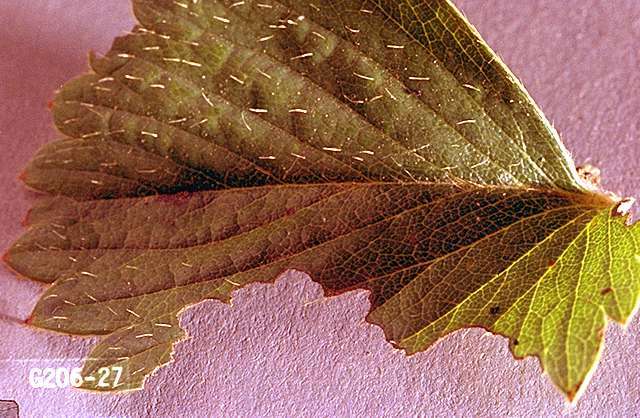 From April to June, larvae pupate and adult emergence occurs. Adults are night feeders that remain in the soil or in organic material at the base of the plant during the day, then climb up to feed on leaves at night. 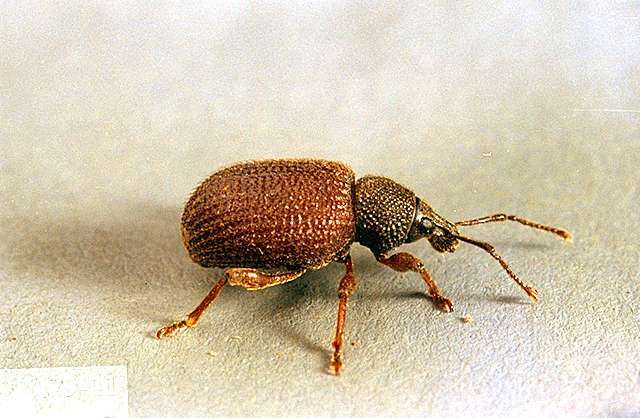 Adult weevils cannot fly, but walk or are carried from one location to another on plant material or equipment. Also, all adults are females capable of laying eggs. Adults are slow moving and should not be confused with swifter predacious ground beetles. Scouting and thresholds Inspect leaves for notching from adult feeding in early summer. Controls should be undertaken soon after adult feeding is observed, but before egg laying occurs, generally about four weeks. Presence of adults can be confirmed by night inspection of foliage on warm, still evenings. Or, look for adults in the day by looking through plant debris at the base of the plant. Laying a small piece of cardboard next to the strawberry plant will provide a refuge that can be checked easily in the early morning. Nematodes, such as Heterorhabditis spp. and Steinernema spp., have shown some effectiveness in controlling larvae when applied as the label directs, as a drench. 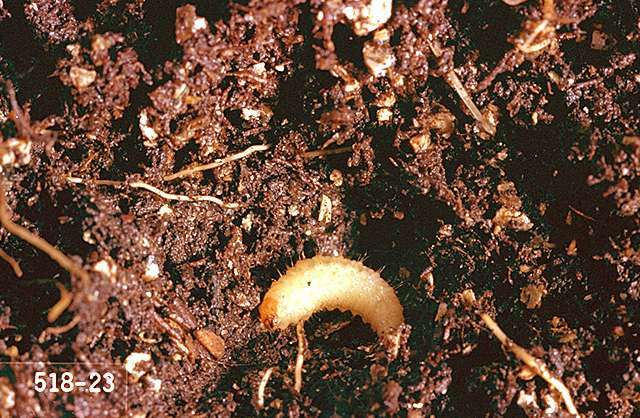 Nematodes must be placed in the root zone where weevil larvae are present. Home gardeners: Hand-pick adults when found. Controls adults only. Maximum control is achieved only if applied at night, when weevils feed. Control is usually poor when applied by day or on cold or windy nights. bifenthrin (Brigade WSB and other brands) at 0.05 to 0.2 lb ai/a. PHI 0 days. Do not apply more than 0.5 lb ai/a per season. Closely monitor spider mites during the following season. malathion (several brands) at 1 to 2 lb ai/a (check label for rates). PHI 3 days. Apply at night for maximum effectiveness to control adult weevils when present. thiamethoxam (Actara) at 0.062 lb ai/a. PHI 3 days. Foliar applied. Do not apply during bloom or when bees are foraging in the area. Note "Bee Advisory Box" and restrictions on the label. Actara and Platinum have the same active ingredient; for resistance management, do not follow one with the other. thiamethoxam (Platinum) at 0.078 to 0.188 lb ai/a. PHI 50 days. Apply to soil and incorporate with irrigation. Platinum and Actara have the same active ingredient; for resistance management, do not follow one with the other. Do not apply when bees are foraging. Wait at least 5 days before placing beehives in the treated field. Note "Bee Advisory Box" and restrictions on the label.